WPT Montreal championship title goes to a player named Jared Mahoney of United States. Mahoney defeated another US player and a three times WPT finalist Darryll fish in a very tough competition. This was the ninth final table playing for fish this year which moves him to the 20th place for player of the year list. 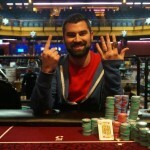 Jared is the new champion of poker playground. He has done really well at the end of the game and took home a massive cash prize of CAD $453,122. He also got a seat to US $15,400 WPT tournament of champions. It was a very tough job for me and I’m happy that I am a proud winner now. Mahoney told to the reporters after winning the championship title and first prize of the tournament. Total number of entries to this particular WPT Montreal poker championship was 697 which generated a cash pool prize of CAD $2.3 million. This was hugh enough cash prize for players participating in to the final table of the game. Here is the detail of final table payouts distributed to different players in WPT Montreal…. The final table of the championship started with six players, where each of them was looking to win this prestigious tournament of the world poker tour Montreal in association with partypoker.com. Jared Mahoney topped the list and got first position whereas AJ Gambino played well and concluded for the sixth position of the event. Gambino took home $87,520. Brian Altman, the only remaining champion’s club poker member got out in the twelfth hands of the play when Carter Swidler doubled up through Altman. Altman,a title winner of WPT Lucky Hearts Poker Open got 4th position for him and took home $144,780. The fifth position/prize of the championship belongs to a pro from Canada Mr. Carter Swidler. He made CAD $108,410 through his winnings. This was one of the largest poker tournament played in Montreal, Canada. The event was seven day long and was open for player all around the world.